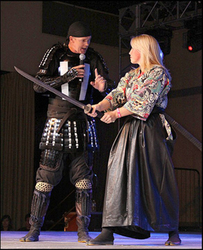 The husband and wife team of Daniel and Jillian Coglan are full-time martial art instructors, specializing in 16th century Samurai Arts. When not teaching at their dojo, the Kojokan, they travel the United States performing and teaching the ancient ways of the most famous warriors in history. With a combined 35 years of experience, their show is a unique blend of history, combative skill, and humor, designed to educate and entertain audiences both large and small. Beyond their martial skills, the dynamic duo collaborated to write, direct, host, and star in a 12 episode TV series entitled, "The Way of The Samurai." Daniel is also an author, with several martial art articles published, and is currently working on his second full-length novel.